The IEEE (Institute of Electrical and Electronics Engineers) describes itself as "the world's largest technical professional society -- promoting the development and application of elector-technology and allied sciences for the benefit of humanity, the advancement of the profession, and the well-being of our members." The IEEE fosters the development of standards that often become national and international standards. The organization publishes a number of journals, has many local chapters, and several large societies in special areas, such as the IEEE Computer Society. After filing the petition for formation of the IEEE- GBU Student Branch on February 8, 2012 with the approval of at least 12 eligible student members and 2 IEEE Members above student grade, with the Student Branch Counselor Dr. Shabana Urooj and the Student Branch Chair Chirag Ahuja, got the approval for the Branch on April 6, 2012 from the headquarters with the Student Branch Code is 10301 and the School Code is 60048501. 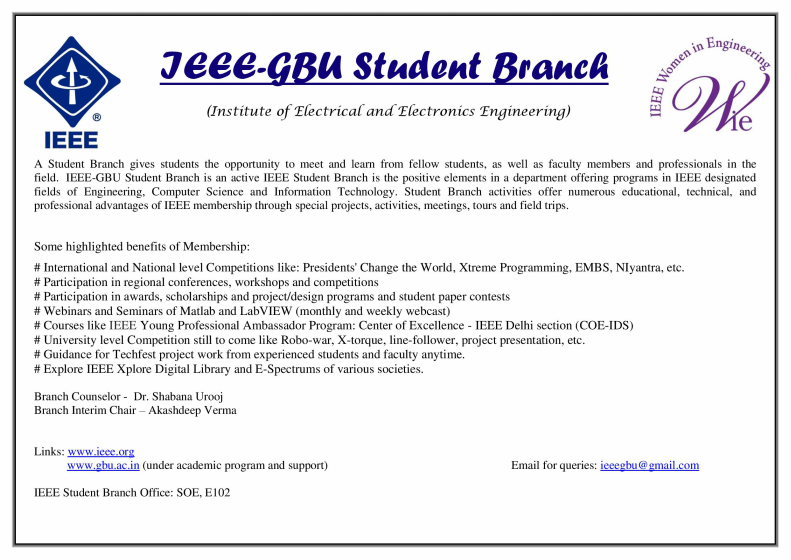 The Student Branch is located in Region 10 and the activities will be of interest to the volunteers of IEEE Delhi Section.